John Nichol is Professor of Saxophone at Central Michigan University and has performed at the Montreaux Jazz Festival in Montreaux, Switzerland (1997), the North Sea Jazz Festival (1997) and the Ford Detroit International Jazz Festival (2000, 2001, 2002). Professor Nichol has also performed by invitation at eight World Saxophone Congresses: Chicago, Illinois (1979), Nuremberg, Germany (1982), Kawasaki, Japan (1988), Valencia, Spain (1997) and Montreal, Canada (2000), Minneapolis, Minnesota (2003), St. Andrews, Scotland (2012), and Strasbourg, France (2015). Professor Nichol has performed with the Jimmy Dorsey Orchestra, the Harry James Orchestra, the Nelson Riddle Orchestra. Professor Nichol can be heard on Flights of Fancy (Centaur Recording, 2003), Caught in the Act (White Pine Music, 2007), Woodwind Echoes (White Pine Recording, 2008), and Conspiracy Theory (White Pine Music, 2010). John Nichol is a Yamaha Performing Artist, a Vandoren Artist, and is a Past President of the North American Saxophone Alliance. The Central Michigan University Saxophone Ensemble is directed by Professor John Nichol. This ensemble focuses on presenting original works for this medium, and also features the many saxophone ensemble arrangements of Professor Nichol. 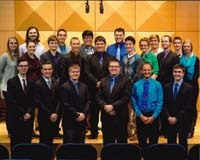 Recent performances include the NASA Region V Conference at Fort Wayne, Indiana and was the featured ensemble at the biennial CMU Saxophone Day. The current ensemble is comprised of 17 undergraduate saxophone music majors and 2 saxophone performance master degree students. Jeffrey Allardyce Soprano Saxophone undefined . . .
Parker Fritz Sopranino Saxophone undefined . . .
Emmet Harris Soprano Saxophone undefined . . .
Abby Shepard Soprano Saxophone Aundefined . . .
Michael Hanna Alto Saxophone undefined . . .
Erin Paxton Alto Saxophone undefined . . .
Donovan Boxey Alto Saxophone undefined . . .
Diego Kieliszewski Alto Saxophone undefined . . .
Kaylee Bernard Alto Saxophone undefined . . .
Akash Watsa Alto Saxophone undefined . . .
Benjamin MacDonald Tenor Saxophone undefined . . .
Nate Soules Tenor Saxophone undefined . . .
Aaron Rajewski Tenor Saxophone undefined . . .
Kyle Mikat Tenor Saxophone undefined . . .
Kyle Pokropowicz Baritone Saxophone undefined . . .
Grace Pawluszka Baritone Saxophone undefined . . .
Michael Lee Baritone Saxophone undefined . . .
Taylor Huitema Bass Saxophone undefined . . .
Alex Toth Alto Saxophone undefined . . .